In recent weeks, Yannis Varoufakis, former Greek Finance Minister, has been under fire because of a secret group he ran, from February to June, whose purpose was to plan for a possible Grexit. Some have charged him with treason – primarily because his group hacked into the Greek Finance Ministry to acquire information they needed for the planning. Others defended him. Whatever the stakes of this minor power struggle, it is a sideshow. In fact, Greece itself is not even the story. In this post-agreement moment, as the Tsipras government capitulates to the Eurogroup’s diktats, we need to grasp the dramatic failure of Syriza’s strategy in its proper context: the wider exhaustion of Left politics. The primary lesson is not (only) that Syriza failed but that the Left, across Europe, is politically exhausted. It is important to identify this weakness not only to acknowledge the limits of what Syriza could ever have done, but also to counter the emergent left-populist view that this is all about Germany. To be sure, Tsipras deserves some blame. If the only planning for Grexit was happening in secret, on condition it never be made public and therefore never part of the bargaining strategy, then it was not just a pointless activity but a sign of Tsipras’ opportunistic willingness to use the Greeks as a stage army. They were there to vote, but never to have a real option granted. After all, for an exit to be a democratic act aimed at something like self-determination outside the Eurozone, it could not be a mere technocratic process of figuring out how to print and distribute notes, denominate payments, and sort out IOUs. It might have required seizing banks to prevent capital flight, nationalizing industries to prevent them being bought up by oligarchs who were hoarding euros outside Greece, rationing of certain basic supplies, even subsistence level economic production for a time. That is something the Greeks would have had to have been prepared for, something asked of them, and something which would have needed explicit popular backing. Tsipras made no effort in this direction and one has to think that he did not ultimately believe in his own people enough even to put the question to them. Nevertheless, we should not lose sight of the extraordinary constraints that Tsipras and the Syriza government generally were under. They took power after Greece had already been through multiple rounds of austerity and seen roughly a quarter of its GDP evaporate. The financial thuggery by the European Central Bank, which engineered a quasi-bank failure in the last days of the negotiations by drastically reducing emergency funding, was illegal and extremely coercive. President of the Eurogroup, Jeroen Djisselbloem, doubled down on the threat, saying “we are going to collapse your banks.” It was clear that Schäuble wanted to turn Greece into something like debtor’s colony and was willing to take only that or let Greece go altogether. Even if Tsipras had, from the very beginning, made more effort to plan for the exit, looked for alternate sources of financing, pre-emptively printed drachmas, readied to seize the banks, moved to nationalize key assets, prepared capital controls, and taken the 50 other steps necessary to minimize the costs of exit, the democratic act would not have been a revolutionary step into a heroic, post-austerian future. It would have been a necessary, high-cost, step away from the clutches of the Eurozone. The reason Greece was so limited in options is that Syriza had no meaningful support from the rest of the European Left. It had no support because the mainstream left parties, from the German SPD to the French Socialists, on through other Western European parties, have so fully committed themselves to the Eurozone and to some version of austerity that they were in no position to open the space within which a proper resistance to the Eurogroup’s divide-and-conquer sadomonetarism could be challenged. Syriza ran up against some world-historic limits that allowed someone other than the Left to dictate not just the basic terms but also the governing ideas of public discourse. Greece was thus a mere conduit for a bailout. It was not a recipient in any significant way, despite what is constantly repeated in the media. Of the roughly 230 billion euro disbursed to Greece, it is estimated that only 27 billion went toward keeping the Greek state running. Indeed, by 2013 Greece was running a surplus and did not need such financing. Accordingly, 65 percent of the loans to Greece went straight through Greece to core banks for interest payments, maturing debt, and for domestic bank recapitalization demanded by the lenders. By another accounting, 90 percent of the “loans to Greece” bypassed Greece entirely. The European people funded the bank bailouts, preserving their irrational financial system, and effectively nationalizing the debt through the Troika institutions. This could have been the start of more democratic control over the economy. Instead, the price of the bailouts was austerity for the southern countries, even less democracy (remember two elected governments, in Italy and Greece, were replaced by unelected technocrats), and worst of all the transformation of a conflict between the people and their economic system into a conflict between creditor and debtor nations. After all, once the majority of the debt was nationalized through the bailouts, the French, Dutch, other Northern Europeans, but above all the Germans, became creditors for the Italians, Spaniards, Portuguese and Greeks. The parties of the Left in these Northern countries could have tried to resist the nationalist impulse that coursed through the financial circuits of the European Financial Stability Facility/European Stability Mechanism, Emergency Liquidity Assistance, and other conduits of the bailout programs. They were, however, so thoroughly compromised by their commitment to the EU and the euro, not to mention their cooperation with what we now know as austerity, that there was no way out. Consider the Germans. Any left-wing politician worth his salt could have pointed out that the way Schäuble talked about Greeks in public was likely how he talks about German workers in private. And, further, that Schäuble represented the interests of a fraction of German capital, not the German people as whole. Indeed, a German politician could have further pointed out that keeping Greece in but forcing it into deeper internal devaluation – namely, benefits reduction and wage repression – simply threatens to lower the wage floor for all of Europe, especially since the latest agreement also involved a direct assault on labor rights. However, the German SDP has been imposing wage stagnation on its own working class for the last two decades, most notably with the Hartz reforms of the early 2000s, imposed more or less in tandem with the rise of the euro. These reforms, pushed through when the SPD’s Gerhard Schröder was Chancellor, reduced benefits and contributed to wage stagnation. Even when the SDP lost to Merkel’s Christian Democrats, they agreed to be the junior partner in a governing coalition, in exchange for a few concessions, some lousy portfolios, and fealty to Merkel’s vision of Germany in Europe. This has left the only significant party with any capacity for opposition utterly compromised. How do you tell workers whom you have been telling to accept wage stagnation and benefits reductions that they should now turn around and spend more money bailing out Greeks? Why save Greek benefits when your own are being chipped away? The SPD has no answers, no capacity even to generate answers, and even if it had generated answers, it could have never presented itself as a credible opposition, able to support the Greeks. That is why the whole affair looked like a unified, German hegemonic operation. Not because Germany really does have a national interest in dominating Europe – no working class has a stake in intensified nationalistic conflict – but because the expression of class divisions has been suppressed by the mainstream Left party itself. A similar story could be told about the French Socialist Party. As already argued on The Current Moment, the French Parti Socialiste (PS) is not a working class party. Indeed, the abandonment of the working class by the French Left goes some way to explaining the popularity of the Front National amongst the young working class French. They rightly judge that the PS no longer represents them. Hollande’s tepid support for Tsipras soon after the latter’s election quickly turned into hostility. Hollande’s intervention at the last minute to stop Schäuble’s push for Grexit was a matter of French national interests, not of ideological or class solidarity. Hollande calculated that a German-provoked Grexit would make life in the Eurozone quite a bit more difficult, with rules ever more rigid. A similar calculation was made by Italy’s Matteo Renzi. The PS’s commitment to European integration and monetary union stems from Mitterrand’s u-turn on membership of the European Monetary System (and the Exchange Rate Mechanism within it) in 1984. Whilst Mitterrand justified his decision to remain in the EMS in the language of Europe and peace, it fitted with his wider goals. He had become convinced of the need to reform the French economy through domestic adaptation rather than to use devaluations of the French franc as a basis for economic competiveness. The EMS was a rules-based framework that would help Mitterrand to pursue this strategy. De Gaulle’s attempt at internal reform failed with the general strike of 1968 and a devaluation in 1969. The Barre Plan of 1976 had also failed, which was why Mitterrand’s alternative of ‘Keynesianism in one country’ had been so popular in 1981. When he abandoned it a few years later, he brought the PS in line with the now established view about the need for an external monetary anchor to encourage reform internally. Mitterrand’s conversion to the power of external rules has become a core belief within the PS and there was no chance that Hollande, Valls, Fabius or Macron would challenge this by supporting Syriza. For them, as for the rest of the European Left, there is no alternative to this way of conducting economic policy. The failure we see is, therefore, not just one of parties taking the wrong stance, or being compromised by their past commitments. It is also the dearth of alternative, left-wing ideas. Being anti-austerity is no longer enough, and it hasn’t been for a long time. It is one thing to say that turning Greece into a debtor’s colony, or undermining the European welfare state, is immoral. It is another to have some conception of and belief in the alternative. No doubt one reason that Tsipras and Syriza were afraid of what Grexit would take is because few found it credible even to consider nationalizing the banks. They only got as far as capital controls, very likely an example of how halfway can be worse than none or all. But the point is that, beyond outrage, there isn’t much in the way of a credible Left alternative to what gets shoved down the people’s throats each time the dollars or Euros run out. In such a political and ideological climate, there is little the Greeks could have done. In fact, the degree of hope invested in Syriza by the wider European Left, especially around the time of the referendum, was the product of political displacement – not so dissimilar from left-wing support for the ‘Yes’ vote in the Scottish referendum last year. Unable to lead directly, the Left will project its needs and desires onto anything that looks vaguely oppositional, and Syriza had the added advantage of having some actual left-wing elements in it. If Syriza failed to lead, their failure only reflected the wider Left’s failure to imagine itself leading a popular movement that is willing to take responsibility for running society out of the hands of a bankrupt elite. This is a failure not only of Syriza, but of the only other significant movements that have emerged out of the European status quo. Consider Pablo Iglesias, leader of Spain’s Podemos Party. In July Iglesias took pains to distance himself from Greece and to commit himself, if elected, to staying in the euro. He then openly professed that there is nothing he can do to resist the anti-democratic character of the EU – despite claiming the right to lead 45 million people. What better sign that it is not only the technocrats of Europe that are queasy about democracy. The peripheries and the core are constrained by the weakness of the Left everywhere. Recent events in Greece have baffled many observers. Prime Minister Alexis Tsipras walked out of talks with Greece’s creditors, calling a snap referendum on their proposals. It appeared to be crunch time. Tspiras denounced the EU’s ‘blackmail-ultimatum’, urging ‘the Hellenic people’ to defend their ‘sovereignty’ and ‘democracy’, while EU figures warned a ‘no’ vote would mean Greece leaving the Euro. Yet, even during the referendum campaign, while ostensibly pushing for a ‘no’ vote, Tsipras offered to accept the EU’s terms with but a few minor tweaks. And no sooner had the Greek people apparently rejected EU-enforced austerity than their government swiftly agreed to pursue harsher austerity measures than they had just rejected, merely in exchange for more negotiations on debt relief. This bizarre sequence of events can only be understood as a colossal political failure by Syriza. Elected in January to end austerity, they will now preside over more privatisation, welfare cuts and tax hikes. How can we explain this failure? I argue three factors were key. First, the terrible ‘good Euro’ strategy pursued by Syriza, the weakness of which should have been apparent from the outset. The second factor, which shaped the first, is the overwhelmingly pro-EU sentiment among Greek citizens and elites, which created a strong barrier to ‘Grexit’ in the absence of political leadership towards independence. Third, the failure of the pro-Grexit left, including within Syriza, to win Syriza and the public over to a pro-Grexit position. The strategy pursued by Tspiras and his former finance minister, Yanis Varoufakis, has been dubbed the ‘good Euro’ approach. Essentially, they argued that a resolution to Greece’s economic depression could be found within the confines of the single European currency. The failure of previous governments to do this was simplistically assigned to the fact that they ‘never negotiated’ with the Troika but merely implemented its demands. Instead, Syriza would make common cause with other anti-austerity groups and sympathetic governments across Europe, pushing for more favourable bailout terms. This involved an attempt to ‘delegitimise’ the creditors by appealing – as Tsipras did even when denouncing the creditors – to the ‘founding principles and values of Europe’, supposedly norms of social justice like ‘rights to work, equality and… dignity’. From this perspective, the referendum was never intended to be a decisive moment for the restoration of Greek democracy and autonomy. It was merely called to strengthen the Greek government’s position when bargaining with the creditors, which is why Tsipras never stopped seeking another ‘bailout’ even as campaigning was underway. But to any clear-eyed observer, this strategy was disastrous from the outset, because it rested on two flawed premises. The first was that the allies Syriza sought were either too weak, or simply did not exist. Perhaps the most remarkable thing about the European response to the global financial crisis has been the near-total absence of any effective resistance to the conversion of a banking crisis into a fiscal crisis of the state and from there to the imposition of austerity. With the exception of Greece and Spain, elections across Europe have tended to shift goverments to the right, even – as in Britain – after five years of cuts to state spending. The lack of effective anti-austerity resistance itself reflects the wider collapse of left-wing political forces from the 1980s. The disarray of the rump parties of social democracy, clearly unable to offer any alternative to austerity, is merely the prolonged death rattle of this epochal defeat. This was never promising terrain for a ‘good Euro’ strategy. One hope of Syriza was the rise of Podemos in Spain – like Syriza, a loose alliance emerging from street-level, anti-austerity protests. But, as Varoufakis rapidly realised, ‘there was nothing they could do – their voice could never penetrate the Eurogroup’. Similarly, while Syriza notionally classified EU governments as pro-austerity, anti-austerity and neutral, with pro-austerity governments ostensibly in the minority, it was unable to leverage any international support. The French – perhaps the main hope – promised support in private, but criticised Greece in public. Nor were the governments of other countries suffering from EU-imposed austerity sympathetic. In fact, Varoufakis recalls, ‘from the very beginning… [they] made it abundantly clear that they were the most energetic enemies of our government… their greatest nightmare was our success: were we to succeed in negotiating a better deal for Greece, that would of course obliterate them politically, they would have to answer to their own people why they didn’t negotiate like we were doing.’ It should therefore have been immediately clear to Syriza that the building materials for the progressive bloc it hoped to construct simply did not exist. Eurobarometer: percentage of EU citizens expressing trust in EU institutions. Source. Eurobarometer: what does the EU mean to you personally? Source. As Varoufakis and Tspiras discovered almost immediately, EU institutions have little to do with democracy, either. The informal Eurogroup of Finance Ministers, Varoufakis notes, makes ‘decisions of almost life and death, and no member has to answer to anybody’. ‘From the very beginning’ (i.e. from their first meeting in February), Varoufakis encountered a ‘complete lack of any democratic scruples, on behalf of the supposed defenders of Europe’s democracy’. Germany’s finance minister told him: ‘Elections cannot change anything’. Some ministers agreed with Syriza’s critique of austerity, but essentially said, ‘we’re going to crunch you anyway.’ What further demonstration did Syriza need that EU leaders are not interested in social justice, only containing the Euro-crisis – and thereby protecting their own shoddy financial institutions from debt default and contagion – by making Greece the whipping boy of Europe? Unsurprisingly, critics had declared the ‘good Euro’ strategy a failure as early as February, while Varoufakis’s post-resignation interviews reveal that its chief executors also swiftly recognised its flaws. So why did it ever appear a good idea in the first place? Ultimately, Syriza was elected on a platform both of ending austerity and remaining in the Euro – the latter position being shared by all of its main political rivals and by 80 percent of the public. This contradictory position reflects the attachment of Greek citizens and elites to ‘Europe’ as a refuge from their domestic political difficulties, and thus a reluctance to confront and resolve these difficulties alone. As The Current Moment’s co-editor, Chris Bickerton, has shown, this is part of a general trend across the EU. From the 1970s, faced with crises of rising expectations and increasing social unrest, European elites have – through varying national trajectories – tried to create a new social, political and economic settlement by entrenching themselves within international elite networks. The EU’s structures are generally not supranational authorities but rather elite solidarity clubs, where ministers pursuing unpopular ‘reform’ agendas can draw upon each other’s support against their respective populations, thereby basing the content and legitimacy of their actions not on democratic mandates but on the legalistic European processes of policy coordination and harmonisation. By linking virtually every state apparatus across European borders, elites have thereby transformed once-sovereign nation-states into EU ‘member-states’, heavily constrained, with popular sovereignty deliberately negated. European elites can no longer imagine life outside of these structures, because it would represent a vast step-change: a need to re-engage with their own populations as the sole source of their authority, and the need to articulate clear political visions for their nations instead of relying on the latest EU action plan to guide their polities. Each member-state has followed its own particular trajectory into this dismal arrangement. In Portugal, Spain and Greece, the process was strongly marked by their 1970s transition from authoritarian rule. In much the same way as the recent Scottish referendum proposed to make Scotland independent of the United Kingdom but immediately constrain its autonomy by retaining EU membership, these southern European nations emerged from authoritarian rule only to constrain democratic choice by swiftly joining the then European Economic Community. For the Greeks, joining ‘Europe’ was apparently a way to help draw a line under the past. It signalled their rejection of military rule, their ‘identity’ ‘as Europeans’, their distinction from authoritarian neighbours like Albania and Turkey. And it precluded the return of authoritarianism by locking Greece into various intergovernmental agreements and processes that entrenched liberal rights. The same motive and process had guided the formation of the European Convention on Human Rights in the early post-war years, and the later flight of Eastern European states from ‘Brezhnev to Brussels’, as Bickerton puts it. Thus, for wide swathes of the Greek public, and especially the liberal and left elite, membership of the EU is valued precisely for its constraints. The fear, as Varoufakis himself clearly articulated, is that the beneficiaries of Grexit would not be the ‘progressive left, that will rise Phoenix-like from the ashes of Europe’s public institutions’, but rather ‘the Golden Dawn Nazis, the assorted neofascists, the xenophobes and the spivs’. His successor, Euclid Tsakalotos, issued similar warnings from the foreign ministry. Their fear was essentially of what the Greek people would do, left to their own devices. This concern is hardly unique to Syriza. Across Europe, the dominant – perhaps only – elite justification for European integration is that its only alternative is a return to nationalism (or worse) and war. The Greek version of this politics of fear is simply mediated through the recent historical experience of military rule. Syriza’s embrace of this pessimistic narrative clearly signified a profound lack of faith in its own capacity to lead Greeks towards a more progressive future as an independent nation. This quite widespread ideological attachment to Europe was undoubtedly reinforced by the apparent economic benefits of EU membership before the Euro crisis. In 1974, when the Colonels’ regime fell, Greek GDP per capita was just $2,839. When Greece joined the EEC in 1981, it was $5,400. By 2001, when Greece joined the Euro, per capita income had more than doubled to $12,418. Under the Euro, average incomes then nearly tripled to $31,701 by 2008. 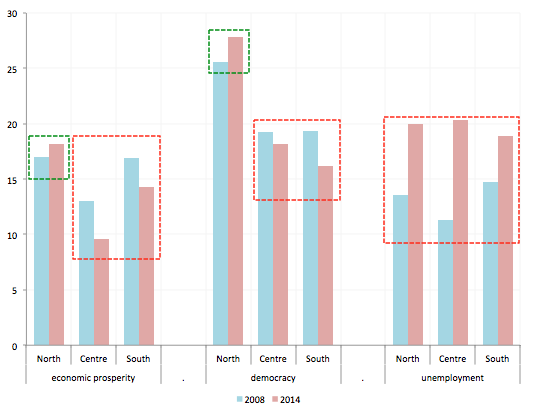 Greece literally appeared to go from third world to first in the space of two generations. In real terms, of course, the increase was always smaller – from $12,829 to $24,148 from 1974-2008 – but this was still a significant ‘catching up’ with other European states. As is now widely recognised, much of the post-2001 boom was fuelled by reckless borrowing and its benefits were always maldistributed, with a narrow oligarchy dominating a state-led patronage system. This is undoubtedly why the Greek oligarchy, while evading the consequences of austerity itself, has waged a strong pro-EU campaign, including through the media organisations it dominates, and is implacably opposed to Syriza, which had pledged to ‘destroy’ the ‘oligarchy system’. However, economic benefits also flowed to a wider coalition, with handouts like early pensions for professional groups and public sector unions supportive of the status quo. 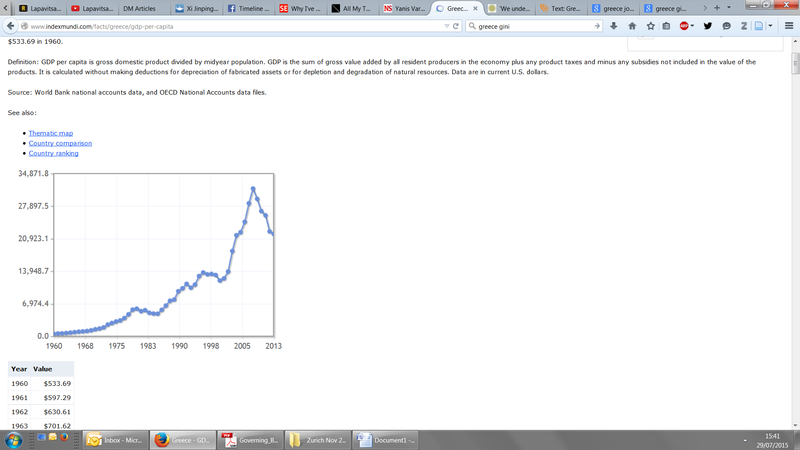 Greek GDP Per Capita, current US$. Source. 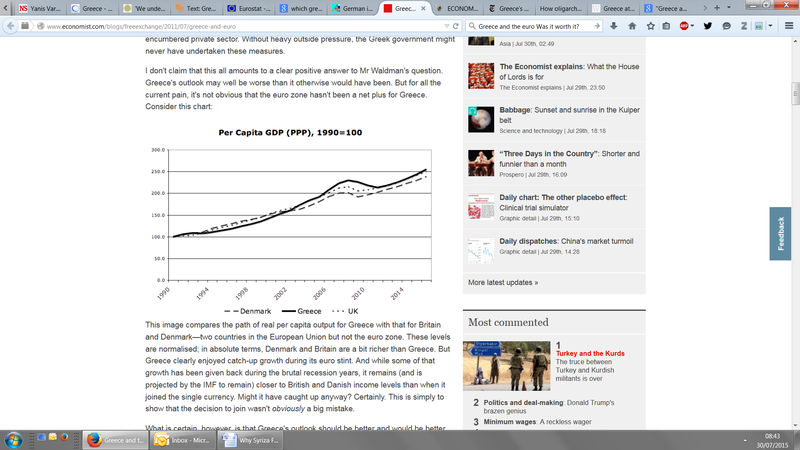 Greek GDP Per Capita (Purchasing Power Parity) 1990=100. Source. Combined, these factors seem to have made many Greeks leery of Grexit, even as the economy shrivelled. For some, when the crisis struck, there was apparently a guilty sense of the chickens coming home to roost – that ‘the party was over’ – with two-thirds of Greeks actually supporting austerity in 2010. Although this support collapsed over the next four years, fuelling the rise of Syriza, fear of the unknown remained very strong. Even in the most favourable scenarios, restoring the drachma would be hugely destabilising in the short to medium term and risk undoing the residual benefits of Euro membership. This motivation seems particularly strong among those with most to lose. All of this helps explain the structural constraints facing Syriza leaders upon their election. The Greeks were both tired of austerity and yet fearful of exiting the Euro. Consequently, they demanded an end to austerity within the Euro. Squaring this circle was an impossible task. But this should not let Syriza off the hook. Insofar as Syriza leaders understood that these popular demands were incompatible, they ought to have exercised political leadership by trying to lead the Greek citizenry towards a more rational position. The most crucial step was to outline a compelling vision for a Greek economy independent of the Euro, where life might be tough for a few years (but probably no tougher than under perpetual EU-imposed austerity), and recovery was eventually possible via the currency devaluation that every sane economist argues is both essential for Greece’s recovery and impossible within the Euro. This Syriza comprehensively failed to do. Despite their leftist élan, its leaders seem just as incapable as their European counterparts of imagining a future for themselves and their country outside the strictures of European integration. Syriza’s failure remains one of leadership and strategy, irreducible simply to popular attitudes. The Syriza leadership has now embraced a deal that it openly admits is rotten, claiming ‘there is no alternative’. This merely signals a refusal to accept political responsibility for articulating an alternative. Ultimately, they – like the leaders of Europe’s other ‘member-states’ – are too afraid of the consequences of genuinely restoring autonomous, democratic decision-making to their nation. As Stathis Kouvelakis comments, this reflects their ‘entrapment in the ideology of left-Europeanism’. When Greek officials denounce the ‘almost neo-fascist euro dictatorship’, they are heaping the blame entirely on German sadomonetarism while evading their own failure to rebel against it, however difficult that rebellion would undoubtedly be. As a consequence of this hesitancy, Syriza leaders spurned the growing social basis for a pro-Grexit line, which emerged despite, not because of, them. While in January 2015, 80 percent of Greeks favoured remaining in the Euro, by the time of the referendum this figure had fallen to 45 percent, with 42 percent favouring the serious consideration of Grexit. Tsipras dependent on opposition legislators to survive, in subsequent votes that number has shrunk to 36 (with Varoufakis among the defectors), while Left Platform ministers have been sacked or resigned. Amazingly, the ‘good Euro’ strategy persists. Part of the explanation for this is the nature of Syriza itself as a loose coalition rather than a traditional leftist party. Initially merely an electoral coalition, formed to contest the 2004 elections, Syriza became a party only in 2012, merging 13 political groups ranging from social democrats to hard-line Marxists. Syriza’s dominant parliamentary faction has always been Synaspismós, itself a democratic socialist coalition, led by Tsipras. Syriza’s ‘Left Platform’ – comprising the ‘Left Current’ and ‘Red Network’ – are relative newcomers and, even when joined by the Communist Organisation of Greece (KOE), also a Syriza member – simply lack the numbers required to impose their preferences. Moreover, despite the 2012 merger, Syriza did not develop party structures capable of discussing, determining and imposing a collective ‘party line’. This looseness permitted a high degree of open internal dissent and had a ‘horizontalist’ flavour much celebrated by contemporary critics of traditional leftist parties. But the downside is that this organisational form effectively permitted the central leadership to determine policy, while more critical elements simply became a sort of internal ‘loyal opposition’. Syriza’s leftist elements were not unaware of this, but were compelled to join the party having failed in their initial quest to form a broad, anti-EU alliance with the anti-capitalist left. As Kouvelathis describes it, the Left Platform crowd joined Syriza in 2012 only after these proposals left were rejected by the main component of Antarsya (Anticapitalist Left Cooperation for the Overthrow), a far-left coalition formed in 2009. The KKE, the Communist Party of Greece, also remained aloof. The sticking point was apparently the ultra-leftists’ insistence on a programme of immediate rupture from the Eurozone as the bulwark of ‘neoliberalism’. However, as noted earlier, in 2011/12 this position had virtually no popular support. 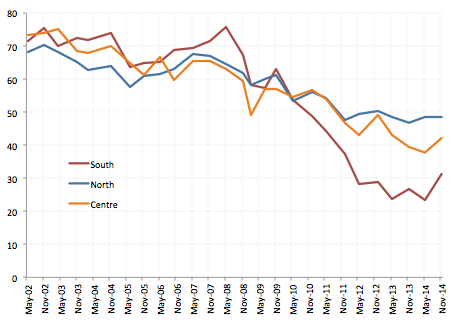 Nor, reflecting the long-standing decline of Greece’s far left, did these far-left parties have any electoral standing. Essentially, while Syriza had the wrong line but at least the capacity to get elected, the radical left arguably had the correct political line but lacked any capacity to translate it into policy. Following a crisis common to all European states in the 1980s, the Greek far-left has been extremely fragmented, remaining, despite the formation of horizontalist alliances, unable ‘to actually articulate an alternative project’, and producing ‘catastrophic electoral results’, according to Antarsya’s Panagiotis Sotiris. This strategic ineptitude led them, unlike Syriza, to fail to translate their mobilisation of Greeks in the 2011 ‘movement of the squares’ into party organisation and electoral success. This was arguably a serious failure of the horizontalist model with its renunciation of forming parties capable of seizing the state. As Sotiris laments: ‘we never realized that the question was about power… reclaiming governmental power. At that point, we did not have this position, but Syriza had it’. But these questionable tactics, an inevitable part of the difficulties of party politics, are probably secondary to the larger strategic failure, which was to neglect to present the citizenry with an alternative plan for Greece’s future outside the Euro until early July. Kouvelakis now admits this was a serious mistake. It is not that the plan took forever to draft: it was already in hand long ago, but there was ‘internal hesitation about the appropriate moment to release it.’ This apparently stemmed partly from fears that Greece was ‘ready’ for Grexit. Lapavitsas has long argued for a managed and ‘orderly’ Grexit, but as late as 10 July he openly doubted whether any preparations had been made. Varoufakis’s subsequent revelation that only five officials had been tasked with this suggests that he was correct (as well as signifying his utter disinterest in alternatives to striking deals with the creditors). Essentially, reflecting its marginal position in the ruling coalition, the Left Platform was dependent on the governing part of Syriza to lay the technical ground for their Grexit strategy, which they clearly had no interest in doing. Its members had also become swept up in day-to-day events, Kouvelakis recalls, being ‘neutralized and overtaken by the endless sequence of negotiations and dramatic moments and so on… it was only when it was already too late… that [our] proposal was finally made public… This is clearly something we should have done before.’ The Left Platform thus failed to provide the leadership that their Syriza colleagues refused to provide and that their compatriots so badly needed. What lessons can we draw from this sorry tale? The main one is that the European left must shed its illusions about European solidarity. First, the EU is not, and has never been, a font of democracy and social justice. The left, broadly defeated at home through the 1980s, has increasingly put its faith in supranational institutions to protect human rights and social protections, including the EU’s ‘social chapter’. That this only ever expressed the left’s domestic weakness was starkly revealed when European elites combined after 2008 to inflict austerity on their own peoples, and domestic resistance was utterly ineffective. Appealing to EU leaders to uphold norms of democracy and social justice, as Syriza did, is clearly futile. Syriza should be credited with one achievement. It has finally pulled away the veil, forcing everyone to recognise the EU’s true character. But, secondly, it is equally illusory to put one’s faith in European parties, peoples and social movements, in the hope of a transnational alliance capable of generating more progressive outcomes. This hope for a ‘counter-hegemonic bloc’, long expressed by Gramscian scholars of the EU, has been peddled for 20 years without success, expressed in forms like the European Social Forum, which ultimately go nowhere. Sadly, Syriza found little to no effective support beyond their own borders. Again, this reflects the collapse of progressive political organisations capable of turning humanitarian sympathy into meaningful political action. This experience strongly suggests that the prevailing European order cannot be effectively contested by progressive forces at the European level. They are simply too weak and isolated. After all, part of the elites’ purpose in rescaling governance to the European level is precisely to outmanoeuvre opposition, which is rightly assumed to be less able to organise regionally than nationally. This suggests that progressive forces must operate primarily on the more hospitable terrain of the nation-state. They need to lead a movement among their own people, even if it means arguing with them, rather than relying on those abroad who already agree with them. This implies a need to recover space for this activism by reasserting the autonomy of domestic politics from European regulation – i.e., by reclaiming popular sovereignty. Despite growing left-wing Euroscepticism, this step seems to remain anathema to most. Syriza’s leadership were openly leery of popular sovereignty, warning of a fascist revival. This fear is widespread among European elites, suggesting a strong suspicion of the masses, perhaps especially among supposed progressives. But even Syriza’s Left Platform seemed wary of articulating the necessary steps for the restoration of Greek autonomy, despite their clear premonitions of disaster. This is a sign of how deeply the ‘member-state’ mode of politics has been entrenched over several decades. It will be a hard habit to kick. Another lesson concerns the organisational form and content of anti-EU resistance. Broad coalitions, rooted in societal mobilisations, are crucial, but insufficient without strong party organisation. Syriza’s formation as a party helped create the structures and programme necessary to help turn popular mobilisation into political power. It thereby achieved what every fashionable, ‘rhizomatic, horizontalist network’ – from Occupy to the Greek far left – has failed to: to exert some grip over state power and thus potentially leverage over social change. Yet, its absence of strong internal democracy also allowed its leaders to pursue an unworkable strategy and even betray the expressed wishes of the electorate. Against the Eurocrats for whom ‘elections cannot change anything’, the task is to rebuild truly democratic parties capable of articulating an alternative and attractive vision for the future of European societies.